Want to use robotic process automation for finance workflows? Here’s how ThinkAutomation can help. Perhaps you send customers a billing alert before payment is due. Or perhaps you send payment confirmations, or non-payment warnings, or payment failure notifications. Whatever the finance email, ThinkAutomation can automate it. First, you create a series of “if this, then that” rules. Our software bots then use these rules to push out your emails at the right time. ThinkAutomation can monitor, pull and enter data to and from different systems — all as part of triggered workflows. 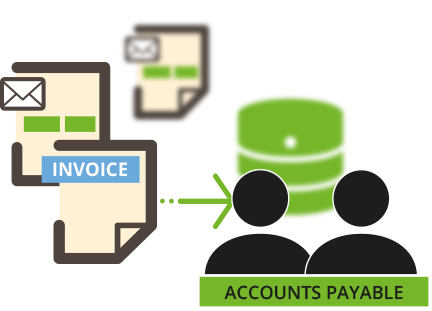 This means it can easily automate customer accounts admin. So, not only can our software bots auto-send your finance alerts, they can also auto-update records. 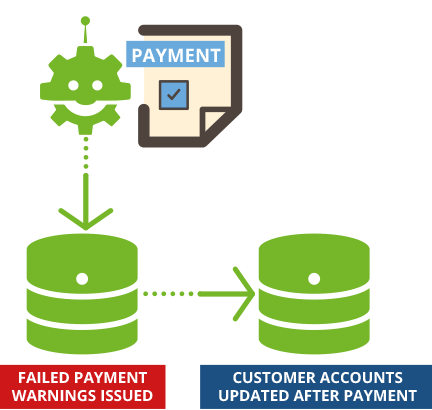 Whenever a customer’s payment status changes, ThinkAutomation will update their account. The systematic nature of bookkeeping makes it a prime area for automation. With ThinkAutomation, you can collect and move key finance data automatically, to prevent manual rekeying. Whatever the source — spreadsheets, emails, PDFs — ThinkAutomation can track and parse. 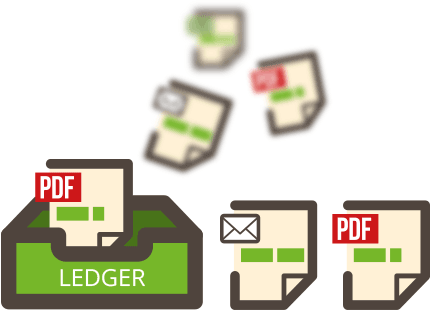 Then, it can execute workflows to feed data from entry point to journal, ledger, or wherever you need it. Creating and processing invoices is a time-consuming task involving repetitive data entry. To help, ThinkAutomation can capture invoices, extract data, and import into your finance systems. It can also validate invoices, route to the right team, and output financial data in a compatible format. In fact, it can run just about any resource-saving invoice workflow that you define. Complete with a sentiment analysis engine, ThinkAutomation can support the financial trade decision-making process. It can mine data from online hubs like Twitter, RSS feeds and specific pages. Unlimited messages can be analysed to produce reports on public opinion and where preferences lie. You can then use this analysis to predict stock market movements and sound investments. 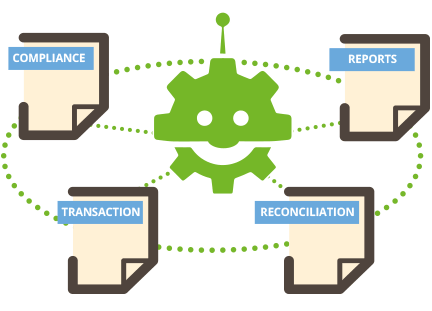 Our software bots can automate a host of routine financial close tasks: reconciliations, transaction posting, compliance monitoring, report creation, and more. This saves enormous time and effort. All you need to do is create the rules and conditions. From there, ThinkAutomation will get to work pushing data, vetting, and filing based on your pre-defined workflows. You might work with several suppliers to source a specific product or service with variable prices. In this instance, ThinkAutomation can help you drive cost-savings across your workplace expenditure. 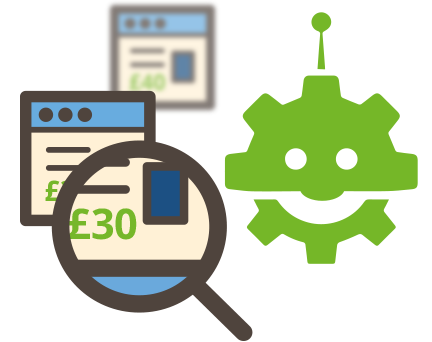 Our software bots can monitor web pages to extract data from pricing tables and catalogues. So, this means you can automatically check for any changes and identify best pricing. 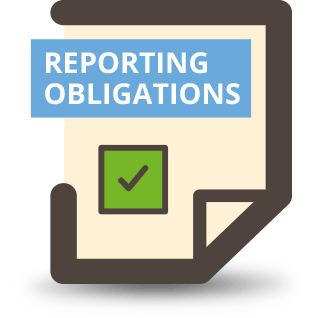 With automation also comes an audit trail for your finance processes. As well as driving clarity, this gives full knowledge of workflows, priorities and emerging risks for internal and external audits. Plus, automation helps ensure compliance. Software bots run via rules, executing tasks exactly. So, they always meet finance reporting obligations and complete necessary data fields accurately and on time. 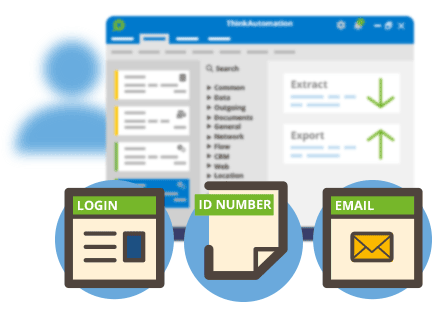 ThinkAutomation is ideal for spreadsheet automation. First, it can auto-populate spreadsheets using data pulled from select sources — inbound messages, database tables, webforms, files, etc. Beyond data entry, it can also manage data extraction from spreadsheets. 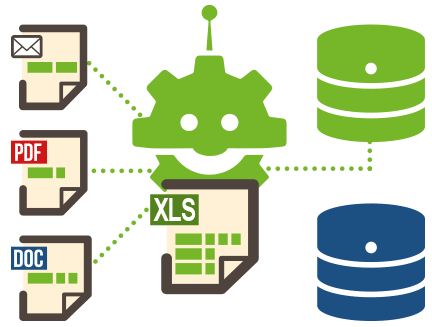 So, if you need cells and tables exported, our software bots can continually push spreadsheet data to your desired system. 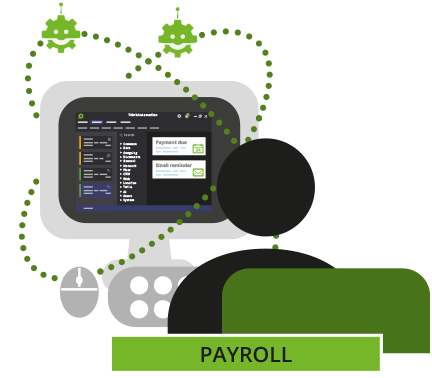 Our software bots can speed up your payroll procedure by running the required sequence of actions, at the required time. Simply pass your routine manual work on to ThinkAutomation. Tasks such as running payroll batch extracts, importing to payroll, and sending salary slips can be slow and data-intensive. ThinkAutomation can do them efficiently and automatically on your behalf. 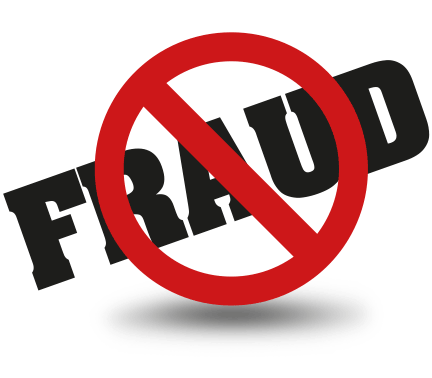 Use ThinkAutomation to help tackle fraud. With conditional processing, you can identify and alert of suspicious activity, then trigger a chain of remedial events to run. For example, to secure transactions, you could create a rule comparing DNS from the IP with a listed physical address. You could set up automated alerts. You could even train our sentiment engine to recognise suspicious messages. Opening and closing accounts is often a systematic process prime for automation. So, create workflows that handle the routine aspects of onboarding and offboarding. That could be updating a system, generating an ID, automating emails, or any other task you need. You write the rules: ThinkAutomation runs them. Ready to introduce automation into your finance processes? 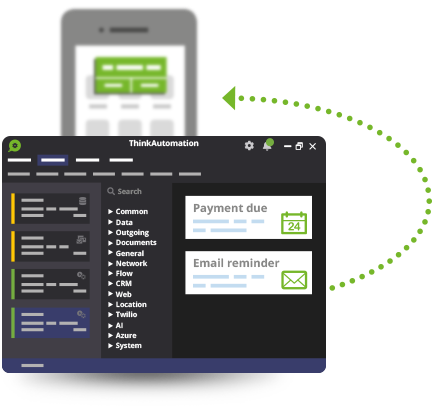 Start building your own automation workflows with a free trial of ThinkAutomation.